My name is Kannan. I am a fire fighter working for the Tamil Nadu Fire and Rescue department, Puddukottai. I have a 10 year old daughter Mathumitha. She is a very bright and intelligent girl who has won many academic prizes including the State level Uranium Talent Search Examination, not just once, but twice. She is not just studious, she wants to learn swimming. She was about to start her swimming classes in 2014 but she got diagnosed to have Acute Myeloid Leukemia in January 2015. She underwent chemotherapy for six months. My wife and I were heart broken, but we got a lot of encouragement and we saw for ourselves that Mathumitha was doing well and though finances were difficult, we managed to complete her treatment. She was well for one year, but now again in June 2016 her disease has come back. We were shattered. We are still not able to come to terms with it. With chemotherapy alone the disease has recurred, so a more intensive treatment which includes bone marrow transplant with her brother Vengatesh as the stem cell donor is required. This treatment needs Rs. 20,00,000/-. I am the only earning member of my family. I do not earn enough to bear the expense. Our life has come to a stand-still. As with everyone our baby is very precious to us. We are trying our best to raise money for her treatment, but 20 lacs is a huge amount. We will be highly obliged with whatever amount you are able to support us. We have a lot of hopes and dreams for our daughter. This transplant will hopefully help us realise atleast a few of those. 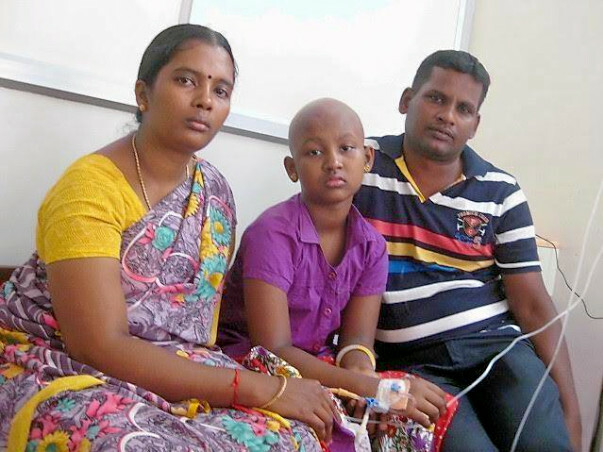 This is an update regarding 12-year-old Mathumitha, she had a "Relapse of Acute Myeloid Leukemia". She underwent Allogenic stem cell transplantation with her younger brother as the donor successfully. She is day five months post-Allogenic Bone Marrow transplant and is doing well. Thank you for supporting Mathumitha and her family in their time of need. We have very good news to share with you. Mathumitha underwent her bone marrow transplant in December 2016 and is currently recovering very well. 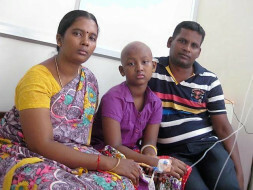 Mathumitha and her family have moved back to their home at Pudukottai and are visiting the hospital for weekly checkups. Mathumitha's seven-year old younger brother who was her BMT donor, after doctor's observation has started continuing his studies. "Once the recovery is over, she will start going to school from the next year. “We are very thankful to the contributors. All this wouldn't have been possible without your help and support" says her mother. We will keep you posted on her progress. 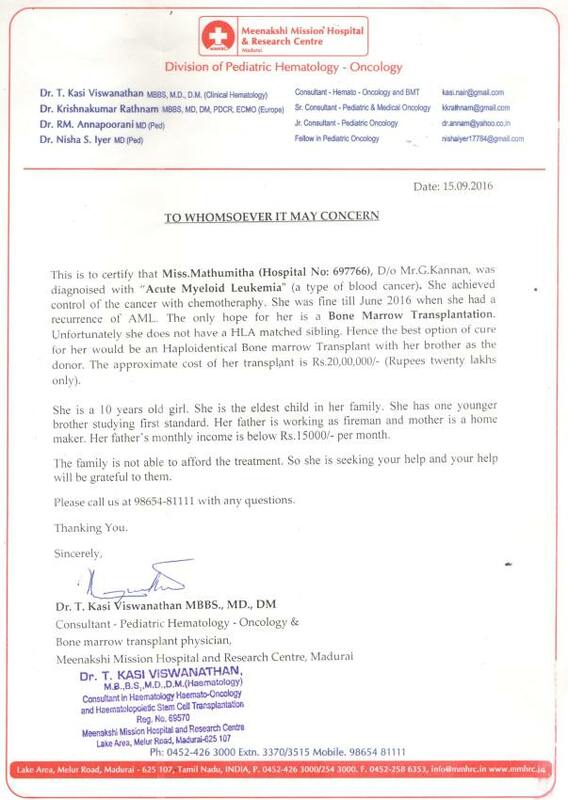 Mathumitha is admitted to the bone marrow transplantation ward. The transplant will be done next week. She will undergo chemotherapy starting tomorrow. Her 7-year-old brother is the donor. For the next five days, he will take injections and will donate the cells as per the requirement for the transplant. Thank you all for the amazing support. We spoke to Mathumitha'a mother and she has asked us to express her gratitude to each of you. We will keep you posted with more updates in the coming days.